There are many species of spiders known to be found throughout Hawaii. Spiders typically live in crevices, rotten wood, gardens, and forest environments. Very few species are known to bite or cause harm to people as they generally feed on insects and other invertebrates. Many spiders are actually very important to our environment and island ecosystem. However, two spider species of concern that are seen in Hawaii are the Southern Black Widow (Latrodectus mactans) and the Brown Widow Spider (Latrodectus geometricus). Their bites can be dangerous and would require a visit to the doctor. 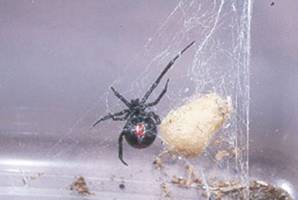 The brown widow is a little smaller than the black widow and its venom is twice as potent as the black widow’s venom. However, the brown widows don’t inject as much venom, they are more timid, and they don’t tend to defend their web. Another spider of concern that is seen on the islands is the Bold or Daring Jumping Spider (Phidippus audax), which measures only a half inch in size. It might look harmless, but its bite is painful and may produce redness, swelling and blistering. Spider bites may occur when humans come into direct contact with spiders when working in the garden, outdoors and around the home. Diagnosis of spider bite is based on recent history and signs and symptoms. Specific diagnosis may be difficult to confirm without seeing the spider bit. Confirmation requires identification of the spider, seeing the spider bite the individual and exclusion of other possible sources. Stay calm. Identify the type of spider if it is possible to do so safely. Identification will aid in medical treatment. Apply a cloth dampened with cold water or filled with ice to the bite area to reduce swelling. A tetanus booster may be recommended if you haven’t had one in the past 5 years. There is no immunity to spider bites. Though rare, spider bites do occur. Your risk of being bitten increases if you live in areas where there is clutter and debris or if their habitat has been disturbed. Widow spiders prefer warm climates and dark, dry places. Again, the brown recluse spider has not been documented in Hawaii. Remove spider webs from around your home. Seal any cracks or openings around your home and install window screens. Wear protective clothing such as long covered sleeves, long pants, hats, gloves and boots when handling piles of materials, lumber, rocks, etc. Eliminate tall grasses and reduce debris and rubble from outdoor work areas. Inspect and shake out clothing and shoes before getting dressed.